Congratulatations to recent graduate Christopher Lacroix (MFA 2018) for winning the Philip B. Lind Emerging Artist Prize and second-year MFA student, Ramey Newell, for being named an honourable mention. 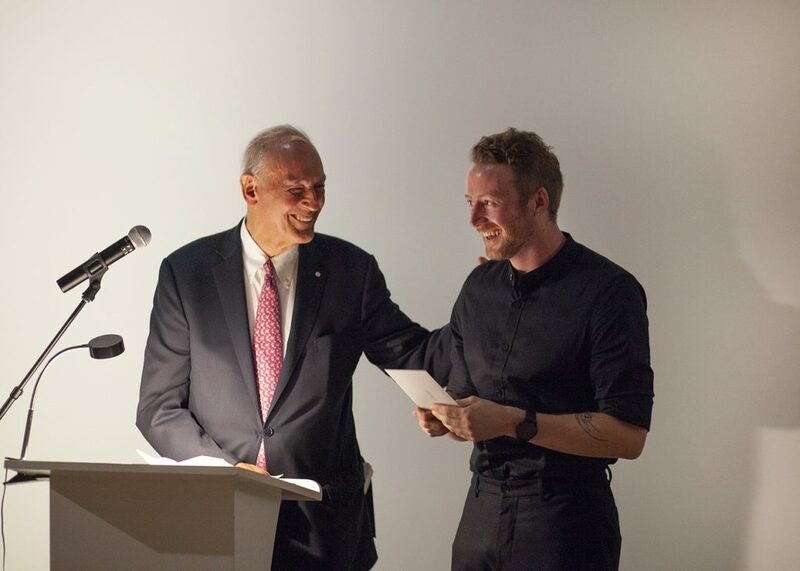 Christopher receives $5,000 toward the commissioning of a new artwork to be exhibited at The Polygon Gallery in 2019. On Thursday September 20, the winner of the Philip B. Lind Emerging Artist Prize was announced at an Opening Reception and Awards Ceremony at The Polygon Gallery. We are delighted to recognize Christopher Lacroix from the University of British Columbia with his winning 2-panel HD video and digital vinyl print: Sometimes It’s Hard to Tell Where It’s Coming From, 2017. Christopher has received a $5,000 prize towards producing a brand new project, which will be featured at an exhibition at The Polygon Gallery in 2019. An honorable mention has additionally been awarded to the runners-up, Matthew Wong from Emily Carr University of Art + Design, and Ramey Newell from the University of British Columbia. Since 2016, The Lind Prize has been awarded to a university student working in film, photography or video. The winner of the Lind Prize receives $5000 and a chance to produce a project with the Polygon Gallery. This year, over thirty candidates were nominated, and a jury of artists and curators chose nine finalists whose work makes up the 2018 Lind Prize exhibition.